As we all know, dog is man's best friend--a part of our family. And as such, we want to make sure that they are fully taken cared of and of course, our number priority for them is that they are fed well. One of the treats that we can give them is dog biscuit, which we can use to give them as snacks or rewards for good behavior. However, we need to watch their weight so, we can't give them a lot of biscuits at one time. 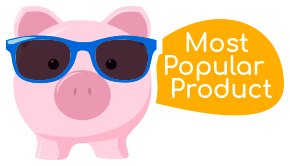 And so, we are going to discuss the different types of dog biscuits, what other buyers are saying, what to look out for as well as some of the most popular brands. Crunchy dog treats are available in a variety of sizes, flavors, and shapes. They include health bars, cookies, and biscuits. The size of the treat you buy for your dog should be appropriate for the dog. Choose one that meets the same standards as high-quality dog foods and one with ingredients of good quality. Crunchy treats are often made from familiar ingredients such as crunchy peanuts and honey, yogurts and bananas, whitefish, sweet potato, potato protein, and chicken just to list a few. Ensure that the crunchy dog treats you choose does not contain artificial colors, flavors, preservatives, wheat or corn. Soft treats are chewy dog treats and are available in a range of flavors, sizes, and shapes. Soft treats are useful during training because they have a pleasant taste & textture, and are often made in very small sizes that are easy to carry around. They should be used in small quantities during training. Go for a brand that meets the similar standards with high-quality dog foods. Freeze-dried and jerky treats are appetizing and are similar to human food. They regularly come in the form of poultry, liver, seafood flavors, chicken, and beef. Most dog owners use them when training because of their unique and desirable flavor. Using human treats on your dog could be bad or good depending on what exactly you are using. Fresh foods such as apples, carrots, and limited amounts of certain seafood are beneficial to your dog. However, there are several foods that you should avoid which include crackers, cookies, hotdogs, cheese and junk foods. Avoid human food treats that contain sauces and seasoning. You should never give your dog onions and raisins as they are poisonous. Garlic should be used sparingly and only when directed by a veterinarian. These treats are actually hard, yet digestible material such corn starch, sweet potato, glycerin, and are not made from animal bones or hides. Dental chews and bone-like treats are believed to promote dental health because of the degree of chewing required to consume them. Although they are safer than real bones, dogs must be supervised when given these treats because they can cause gastrointestinal blockage if inappropriate sizes are swallowed. Not to be confused with rawhides, these are actually made from ears of pigs. They are scrumptious to most dogs and are digestible. 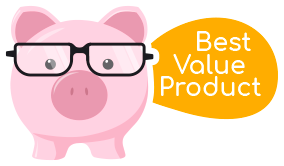 However they can be fatty and when processed with chemicals, pig ears can stain your flooring and furniture, and can even be unsafe. Pig ears should be avoided if your dog is at a risk of obesity. Treats for dogs on special diets are becoming more popular as dog allergies and even preferences are being diagnosed and recognized more often. These are often manufactured by the same food company that makes the regular food for a dog on a special diet. If not, your veterinarian should advise on an appropriate substitute. Animal bones and hooves treats are not generally recommended, especially if cooked. They should be avoided since they can cause gastrointestinal blockage or perforation. They can also cause chipping or breaking of teeth. 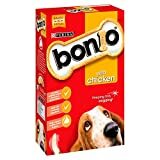 While raw bones can be given under a strict set of circumstances and supervision cooked bones and any kinds of poultry bones whether cooked or raw are never recommended. Consider giving your dog alternative digestible dental chews instead. Homemade dog treats can be healthier and save you a lot of money. Using items that you already have at home, you can whip up a tasty batch of homemade treats within a short time. They can also allow you to cater to specific dietary needs or restrictions of your dog. but of course, a home made treat is only as healthy as you make it, so be sure to use quality, healthy ingredients. And of course, make absolutely sure you know what types of foods are poisonous to your dog. There are many dog biscuits available online and in brick and mortar stores. and it'-s up to you to pick one that best suits your pet. You can ask your veterinarian to give advice as well as read the reviews of customers who have bought the product. It is so good to be able to buy these in bulk. Supermarkets only sell two size boxes which do not last very long at all. This box saves a lot of time and lasts for a much longer period. I have two dogs who have one each before bed to settle them. If I run out and do not have anything to give them, I soon know about it so buying bulk avoids that issue. Excellent - came in a large box with small bags so you can split the box. Means I can keep it in the garage and just have a small nag in the house. Too big for smaller breeds. I have to break them in halves for my young beagle. But she likes them. When buying dog biscuits, choose those that contain natural ingredients so, you don't have to feed your dog with chemicals or preservatives. Also, have your veterinarian check out your pet for allergies and dietary needs and ask for recommendation for what to feed your pet. There are many kinds of dog biscuits out there and you don't want to feed your dog with something that would harm him. 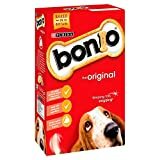 Bonio - is a popular brand that Purina makes, which is low in fat, good for dog's teeth and its recipe has been developed by Purina vets and nutritionists. Wagg - is a brand that creates dog biscuits, which comes in variants of chicken, beef and lamb. These are oven baked so, they aren't oily and greasy and they don't have sugar. 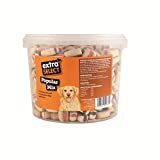 Extra Select - is a brand that creates crunchy dog biscuits, which come in different variants and are ideal for training and snacks.